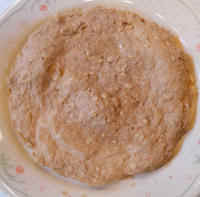 There are basically two ways of making an unleavened flat bread: the ingredients can be mixed together into the consistency of a thick pancake batter, or kneaded together like bread dough. With either method, the finished texture of the flat bread will be chewier than leavened bread, and more like that of a pita or tortilla. Place the quick oats and whole wheat flour in a mixing bowl. 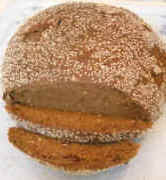 The total amount of the potato/onion liquid portion of the bread dough should be about 1 cup, for each cut of flour. Wash the potato thoroughly, remove the eyes and bad spots (peeling is not preferred if in good condition), cut into chunks, and put into the container of a high speed blender. Wash and peel the onion, cut into chunks, add to the potatoes in the blender contain, add the hot sauce, cover, and run the blender at high speed until the contents are smooth. Pour about 1/2 of the liquid portion into the mixing bowl and thoroughly mix together or knead into the consistency you desire, add additional liquid as needed. If you are making the dough the soft way, scoop it out onto a large microwaveable plate, smooth it out and place in the microwave oven on high heat for about 4 minutes or until the top surface is no longer soft like batter in the center. Then using a spatula, carefully slide it around and under the flat bread to loosen it from the plate and flip it over. 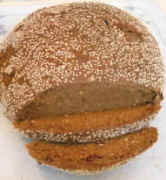 If it is still soft on the bottom, then bake for another minute or two, until it is not longer wet. 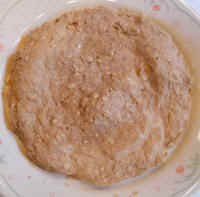 The oats will help keep the flat bread softer, so be careful not to over cook. If you are making the flat bread from a bread dough consistency, dust the outside of the dough ball with a little flour, flatten it out into a flat round shape, and bake either in the microwave oven (as above), but shorten the baking time a little, or bake in a conventional oven at 350 degrees on a pizza or baking pan until it bakes to the consistency you desire. You may also notice that the flat bread may begin to puff up and separate like a pita bread. In the oven, it is not necessary to turn over the flat bread, but as soon as the bread is firm to the touch, but not hard, remove from the oven and cool on a wire rack. When baked, remove from the oven, serve, and enjoy.